Developing approaches to detect, control and prevent endemic, emerging and re-emerging poultry respiratory diseases in the US. Connect and Learn with us. Our annual conference provides opportunities for us to share our latest developments. Learn about our latest discoveries and developments in the poultry respiratory disease field from the PI’s for each project. Understand the ecology of poultry respiratory diseases. The surveillance effort will be built upon the foundation laid by the existing multistate research program (NC-1180). Participants will gather disease surveillance information from each state and share the data among participants and institutions. A standardized and easily accessible data reporting and dissemination system will be developed. Metagenomic-based approaches will be incorporated to better understand the multi-etiological nature of respiratory diseases and also to assess the contributions of the commensal respiratory microbiota towards the establishment of disease. Research on pathogenesis of respiratory diseases involves exploration of the intricate and complex interactions among pathogen, host, and environment. 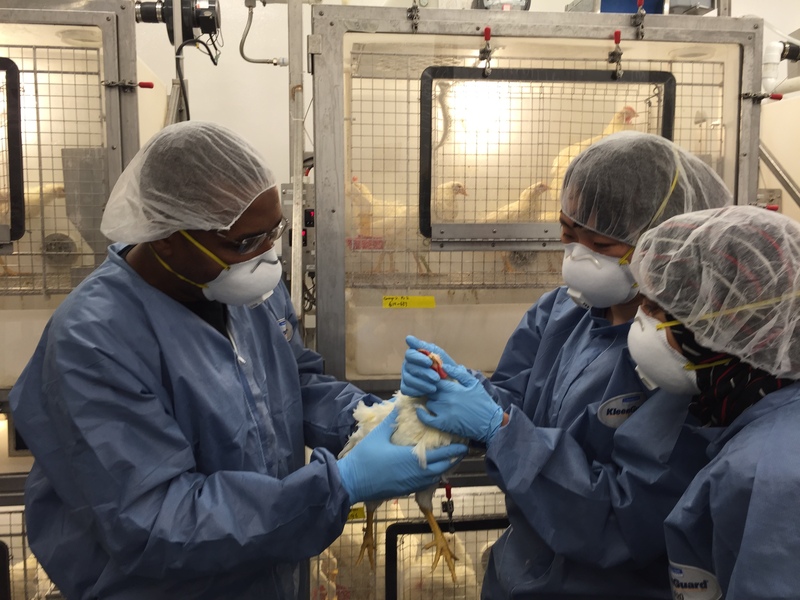 Collaborative efforts will be taken emphasizing contemporary approaches to understand multifactorial interactions of infections that impacts respiratory disease of poultry. Participants will collaborate to determine co-infecting viral and bacterial agents involved in respiratory disease, and host status predisposing to disease. Develop new and improved diagnostic tools, vaccines, and novel preventive measures. We will focus on validation of diagnostic tests, and development and commercialization of new vaccines and antibiotic-free antimicrobial approaches. Efforts will be made for standardization of molecular diagnostic tests among laboratories. Novel vaccines for viral pathogens and small molecule-based alternative control strategies for bacterial pathogens will be developed. Our efforts will focus on translating research findings into practices that will reach both industry and government stakeholders under real world conditions. We will work closely with producers to adopt and implement effective intervention strategies and evaluate their effect on overall respiratory disease prevalence. Extension activities will be designed to work with individuals and groups, including educational programs developed to help producers better understand new management practices, as well as preventative and emergency procedures so appropriate measures can be taken to reduce disease risk and transmission of disease agents. Relevant government stakeholders will be engaged in establishing standardized test protocols, and validating and applying newly developed diagnostic tests and vaccines.